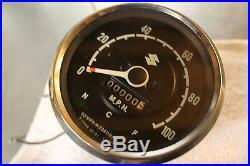 This Speedometer Gauge Tachometer is NOS. 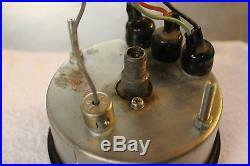 It does not have it’s original package and there are some tiny scuffs on the main body from storage. 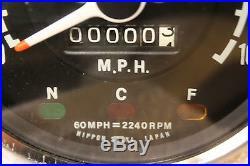 The above models are the closest I came to what this speedo looks like. The noticeable differences are the indicator lights. The above models have two (N and C) this one has three (N, C, and F) Please see all pictures for details and close-ups. We will do everything possible to find out the best solution and make sure that you are satisfied with our products and service. 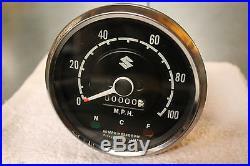 The item “1966 Suzuki S32 S32II S 32 S115 150cc NOS Speedometer Gauge” is in sale since Monday, January 25, 2016. 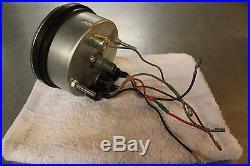 This item is in the category “eBay Motors\Parts & Accessories\Motorcycle Parts\Instruments & Gauges\Speedometers”. 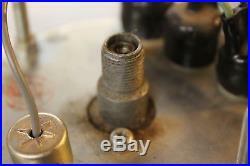 The seller is “hrcycles” and is located in Boise, Idaho. This item can be shipped worldwide.